There are so many clever, earth-friendly upcycling projects to do (and so little time!). Among the more dramatic of these projects is replacing a kitchen counter. The upcycled kitchen counters that I am about to discuss fit best into farmhouse-style or rustic-looking houses. Most of them involve some carpentry work or tile work, so if you are inexperienced, either hone your skills before attempting this project, or hire a highly skilled handyman to execute the project for you. The upside of these projects is that they are a fantastic way to make use of large, leftover pieces of lumber. The downside (well, it is not exactly a downside; maybe it's a limitation) is that the look is rustic. If chippy, or shabby chic, is your style, then one of these countertops could complete the look of your vintage-inspired, ecological farmhouse haven. Upcycled fence board countertop: Blogger Shannon from Fox Hollow Cottage built a countertop from old cedar planks. She painted it chippy turquoise. Her counter is built like a floating shelf, but a similar design and a more resilient, water-tight finish could be employed for a kitchen island countertop. Pine plank countertop: For a more polished look than the upcycled fence board countertop, consider a pine plank countertop like the one built by Lisa Pennington from The Pennington Point. Lisa built her countertops for $61! Just seal it well. Countertop made from an old door: What can old doors not be used for? Interior designer and design blogger Linda Merrill built her own custom countertop by upcycling an old door. The look is quite polished, though slightly rustic. A handmade skirt ups the sophistication factor. Linda achieved a high shine on her countertop by painting it with glossy exterior trim paint. She prepped and primed the door carefully to ensure the smoothest paint application. Countertop tiled with pennies: Though not a professional tile contractor, San Antonio blogger Ashley from Domestic Imperfection tiled her countertop with pennies. Question: Is this a good use of money? Well, all those pennies add up to less than it would have cost her to install a granite slab. Ashley reports that her epoxy-covered penny countertop is very watertight (she even dries her dishes on it). Butler pantry counter made from upcycled old dresser: If you need a counter area right away for a small space, consider upcycling an old dresser. Gypsy Barn, a furniture upcycler in Ontario, has built quite a few coffee stations from old dressers. 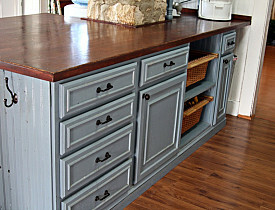 The old dresser becomes a mini-kitchen island or cabinet with counter.